Imagine asking your son what he wants to be when he grows up, and he answers, “I want to be a priest!” What would your reaction be? Would you be worried or elated—or somewhere in between? The truth is that God has a plan for each of your children; he wants them to be happy even more than you do! And their true happiness is found in discovering God’s plan for their lives—their vocation—and following it wholeheartedly. So if you’re truly concerned about your children’s well-being, it makes sense to help them discern their vocations, whether to marriage, priesthood, or religious life. Here are some simple ways to foster openness to God’s call. Snuggle up and read a story. Sometimes the simplest ideas are best! Add some books about famous saints to your bedtime reading. There are dozens of fascinating, age-appropriate stories of saints who were priests and religious. There’s even a comic book about St. John Paul II as a child! Watch a better movie. When it’s time for family movie night, take a pass on Spy Kids 4 and check out A Mission to Love (the life of St. John Bosco). There are tons of other Catholic films that depict heroic and interesting priests and religious. The conversation afterwards is far more meaningful than which explosion was the biggest! Set the record straight. Media depictions of dating and sexuality are often opposed to authentic love. So when a TV show sends the wrong message, set the record straight about what leads to real happiness. Especially around teens, defend the sacrament of marriage. Play dress up! Just as children “play house” and pretend to be moms and dads, help them imagine the life of a priest, brother, or sister. A sheet or towel can serve as a sister’s habit. A Ritz cracker makes a good host for Mass. This kind of play normalizes what can otherwise seem to be an “other-worldly” vocation. Plus it’s a lot of fun! Talk about vocations. Speak openly about vocations to marriage, priesthood, and religious life. From the earliest age, make it clear that happiness in life is following God’s plan. Tell kids that priests have an awesome job because they bring us the sacraments. Teach them that religious brothers and sisters make special vows to live like Jesus. Befriend priests & religious. Invite a priest, sister, or brother to dinner at your home. Personal relationships are key. When kids are comfortable around Fr. John or Sister Margaret, they’re far more likely to be comfortable with the idea of a priestly or religious vocation when they grow older. 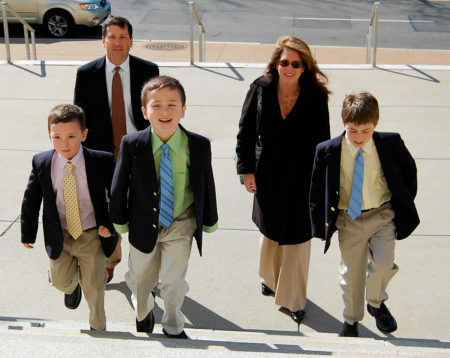 Many Catholic parents have some reluctance about their children becoming priests or religious—at least at first. Typically, parents’ concerns fade as they witness their child’s vocation mature, and his or her happiness grow. “When my little boy plays Mass, it brings joy to my heart. His older sisters play along, even though they’re trying not to laugh. Who knows if he’ll ever be a priest? It’s just great that his little heart is in the right place. I love that.” ~ Amanda C.
“It almost broke my heart when Julie joined the convent. But when I visited her a year later, I could see the happiness and joy just radiating from her. My sadness melted away in an instant. I knew she had found her way in life. In retrospect, I’m glad my plans didn’t work out. As hard as it is for me to admit, God had a better plan for her.” ~ Carl R.
“Our son joined a religious order right after college. We were happy for him, but then he left, saying it just wasn’t his call. But I think it was good that he explored it… He was peaceful when he went in, and peaceful when he left. His mother and I are fine with his decision either way.” ~ Salvatore S.
“I wanted grandchildren so badly. I hid my disappointment when Colin went to seminary, thinking his interest probably wouldn’t last. By the time his ordination came along a few years later, God had really worked on me. I couldn’t have been prouder. His priesthood has been the greatest gift God has ever given our family.” ~ Jenni P.